OCMC Staff and Board gathered at the Mission Center in St. Augustine, FL., from November 12th to the 14th for the organization’s annual Fall Board Meeting. At the meeting a new strategic plan was adopted, and Fr. Martin Ritsi was recognized for his 20 years as service as OCMC’s Executive Director. Three years ago, the Orthodox Christian Mission Center adopted a strategic plan aimed at growing resources and strengthening its ministries. As board members gathered at the Mission Center in St. Augustine, FL, from November 12-14, 2018, staff was grateful to God to report that the goals of this plan have for the most part been reached. Since 2015, the Mission Center has evangelized unreached peoples. In areas where the Orthodox Church is young and reaching out to those who have yet to hear, over 7,000 people were catechized, more than 7,000 youth were ministered to and 3,000 people received medical care. Churches, schools and orphanages were built. Self-sustaining, income generation projects were begun; translations of services made and so much more through the 28 missionaries now serving in the field and the 300th mission team that was sent earlier this Summer. With the previous strategic plan finished, the board unanimously approved the adoption of a new strategic plan for the organization. This new one-year plan still aims at growth, focusing intently on growing the ranks of long-term missionaries serving in the field. It also calls for the refining of the Mission Center’s core purpose and establishing the financial, organizational, and technological mechanisms that will make that growth possible. The first step forward in working toward the key initiatives of the new strategic plan also came during the meeting, as a new budget was adopted, cyber security was reviewed, and five Project Mexico staffers were approved as OCMC missionary candidates. These new candidates will soon begin raising support for their ministries before returning to Project Mexico for the next home-building season. Their approval reflects the growing partnership between OCMC and Project Mexico as both organizations work to provide more opportunities for the faithful to serve in missions and more in-depth training, care, and support for mission workers. The board was made aware of the increasing scope of this training, care, and support, as Geoff Whiteman presented about his work with the missionaries. As a result of intense research and study that has been conducted over the course of the past several years, Geoff shared about the key relationships and support structures necessary for the success and well-being of missionaries serving in the field. He has taken this research and applied it to his role as Missionary Care Coordinator at the Mission Center. OCMC Missionary Director Dcn. James Nicholas followed with a presentation on how this focus on training, care, and support, along with an expediated pathway toward missionary service will facilitate meeting the increasing demand for long-term missionaries in the field. This need and the fruits that missionaries can bear were pointedly articulated by one of OCMC’s newest board members, Michael Kuziak, who recently visited Albania with Fr. Martin Ritsi. During their time, they visited all of the missionaries, toured their many ministries, and experienced the miraculous rebirth of the Church in this former Communist country. Michael, however, lost his designation as newest board member when Nicholas Kourtis of Needham, MA, representing the Greek Orthodox Archdiocese of America, and Dr. Cheryl Johnson of Ft. Myers, FL, representing the Antiochian Orthodox Christian Archdiocese of North America, were officially welcomed on to the board. Board and staff gathered on the night of November 13th to recognize Athena Economou’s efforts earlier in the year to organize OCMC’s first Celebration Gala. 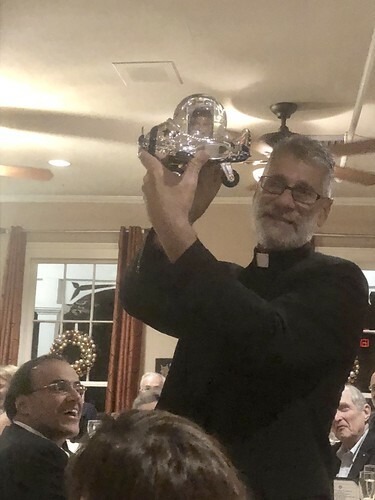 The night also served as opportunity to acknowledge OCMC’s very own Fr. Martin Ritsi for his 20 years of service as the organization’s Executive Director. Current Board President, John Colis, former board presidents Fr. George Liacopulos, Helen Nicozisis, and Cliff Argue, and the Mission Center’s first Executive Director, His Grace Bishop Dimitrios of Xanthos, shared memories of Fr. Martin’s time with the Mission Center and offered their appreciation for his dedication to spreading the Gospel. This year’s Fall OCMC Board Meeting was one of celebration as accomplishments guided by the organization’s previous strategic plan and Fr. Martin’s 20 years of service were recognized. It was also the beginning of a new chapter for the OCMC as new missionaries and board members were welcomed and a new strategic plan was adopted. Please keep OCMC’s board, staff, and most importantly, its many missionaries and mission workers in your prayers as they strive to take the fullness of the Orthodox Faith into the mission field.